Hello guys! 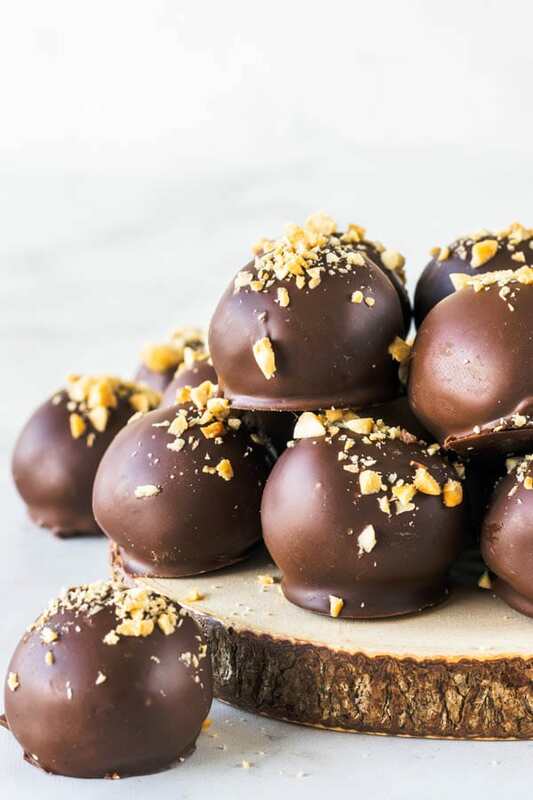 If you saw my Chocolate Peanut Butter Vegan Cake from earlier this week, you saw these truffles being featured on top of the cake. 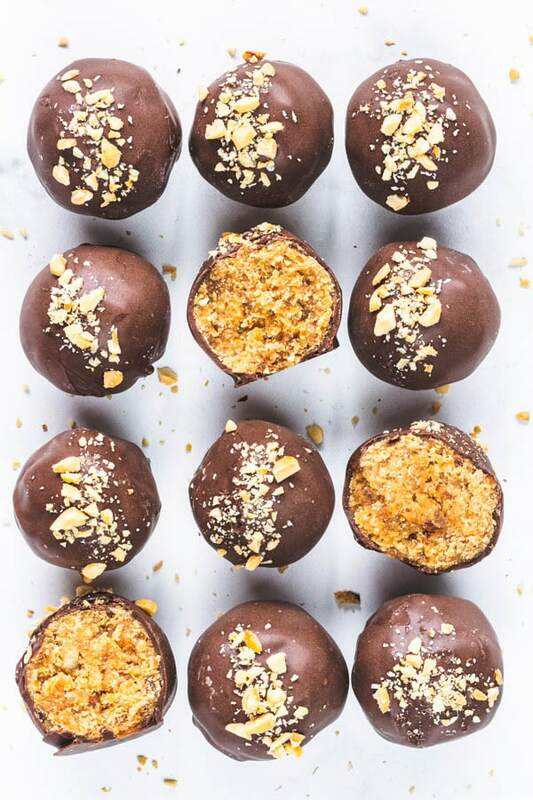 These are my Peanut Butter Vegan Truffles. They are addicting and I can’t stop thinking about them. 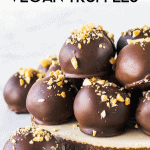 This recipe for my delicious vegan truffles is incredibly easy! It only takes 5 ingredients. 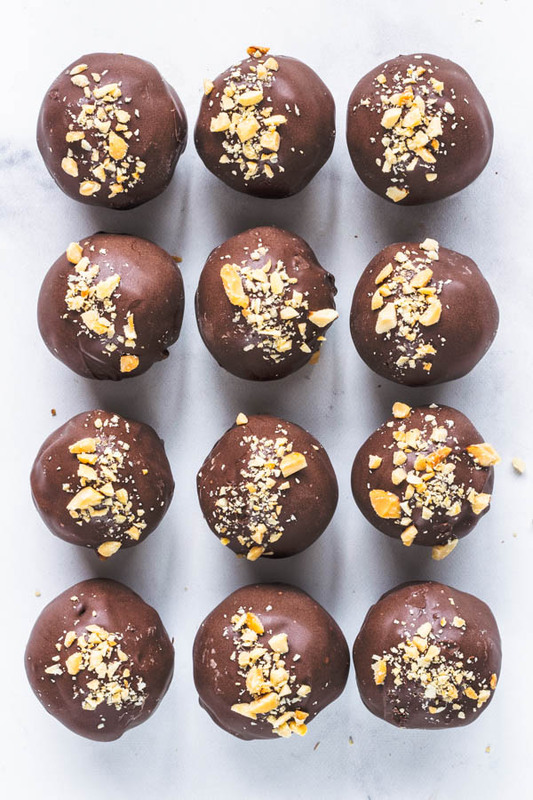 These Peanut Butter Vegan Truffles are gluten-free, refined sugar free, and also paleo. Do you love Peanut Butter? Then these are for you. You could see these are “healthier” peanut butter cups, because they really taste like peanut butter cups. But better, because they don’t have any refined sugar, oils or anything like that. First, make sure your dates are soft. In case they are hard, soak them in warm water for about 15 minutes to make them soft. Start by placing all ingredients (but the chocolate) in a food processor. Process until it becomes a very smooth dough, resembling cookie dough really. Scoop some of the dough with a cookie scoop or spoon. Form them into balls by rolling between your hands. And they are ready to be coated in chocolate. 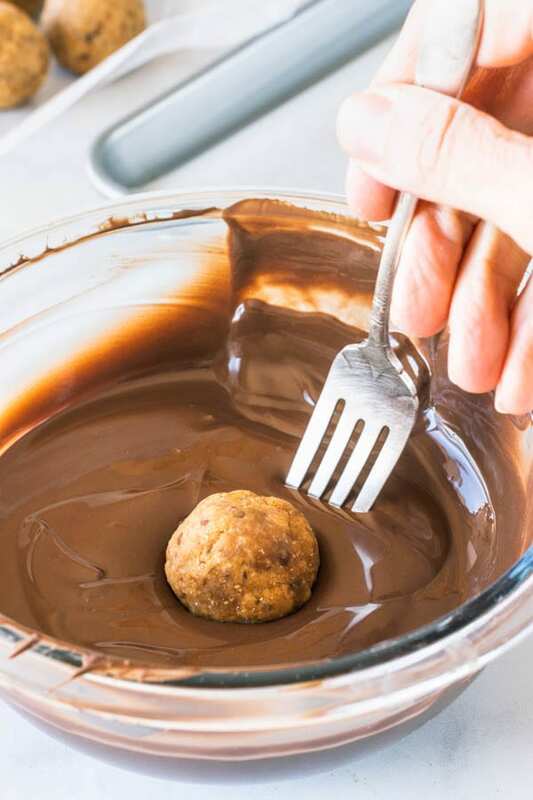 Make sure your dough balls are at room temperature before dipping in the chocolate. 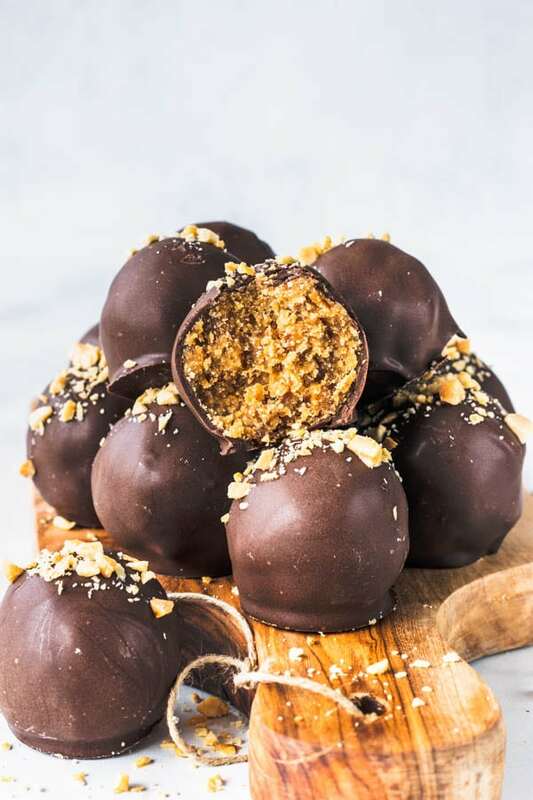 This is important because if the cookie balls are cold when you dip them, they will later expand as they come to room temperature, and will crack the coating chocolate. And you don’t want that to happen. You can temper your chocolate, or use it as it is. 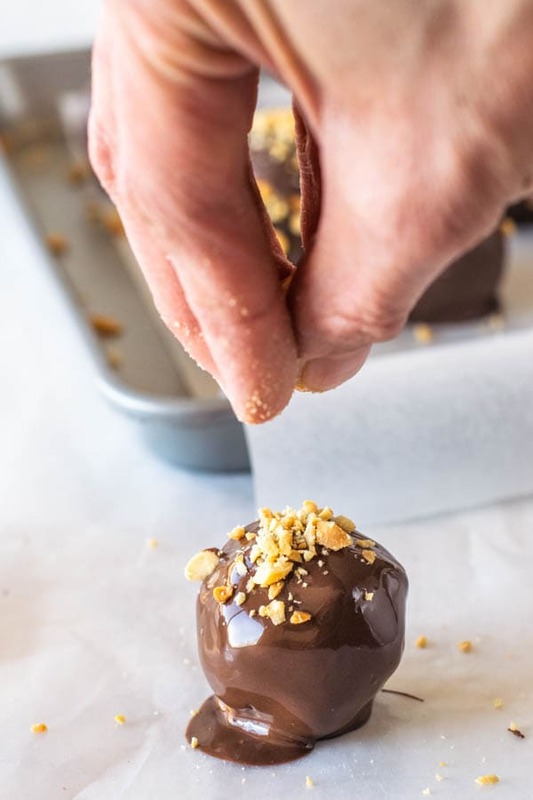 Read more about tempering chocolate here on my Peanut Butter cups post, or on my Chocolate Bombs post. Tempering the chocolate will make so your truffles have a shiny coating, and the texture of the chocolate will also be better, with some more snap to it. Anyway, it’s not mandatory, but here’s the info if anyone is interested. 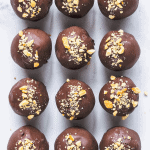 You can sprinkle chopped peanuts over your truffles, or maybe some sea salt. Whatever you would like. Use sprinkles, or maybe even a drizzle of peanut butter. Keep the truffles stored in the fridge, in a container for up to 1 week. They would never last that long. 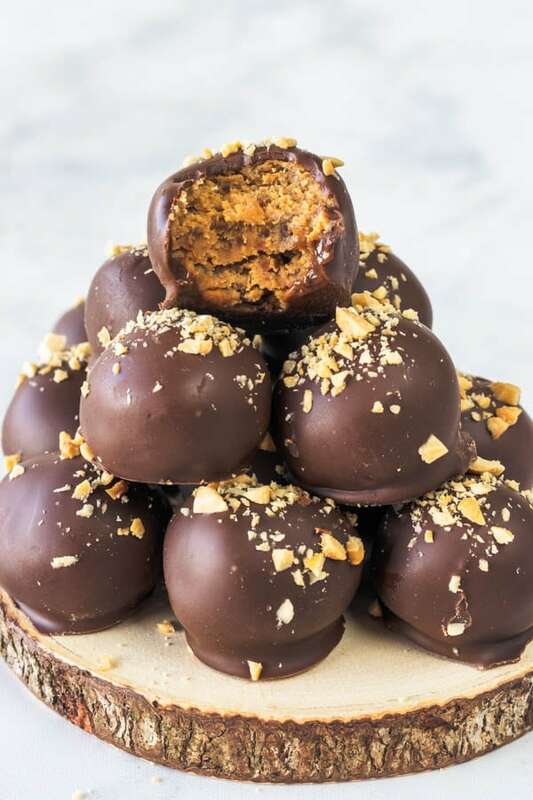 And you can also make my Peanut Butter Chocolate Vegan Cake, to showcase these Peanut Butter Vegan Truffles on the top. 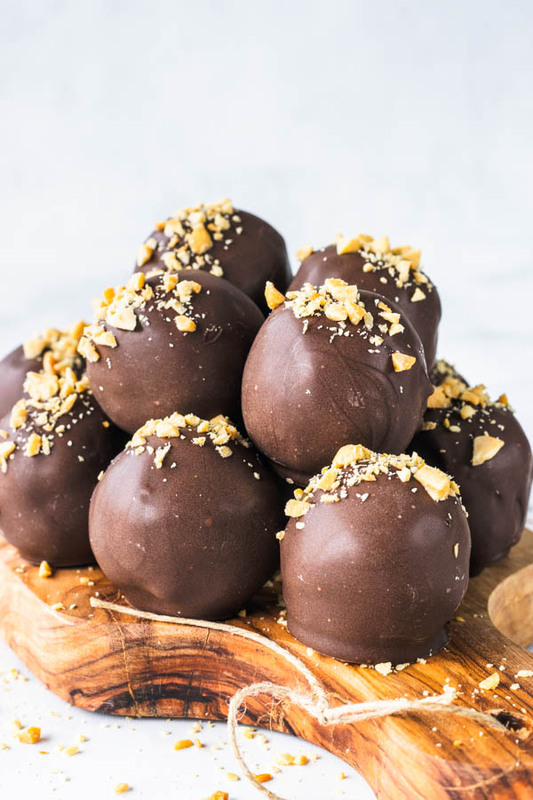 These Peanut Butter Vegan Truffles were so hard to resist I made them twice in the past week. All because I wanted to reshoot them (and re-eat them). I will be making these vegan truffles with different nut or seed butters, and I think it will be awesome! Who’s with me? If you would like to see some more vegan sweets recipes, just click here. 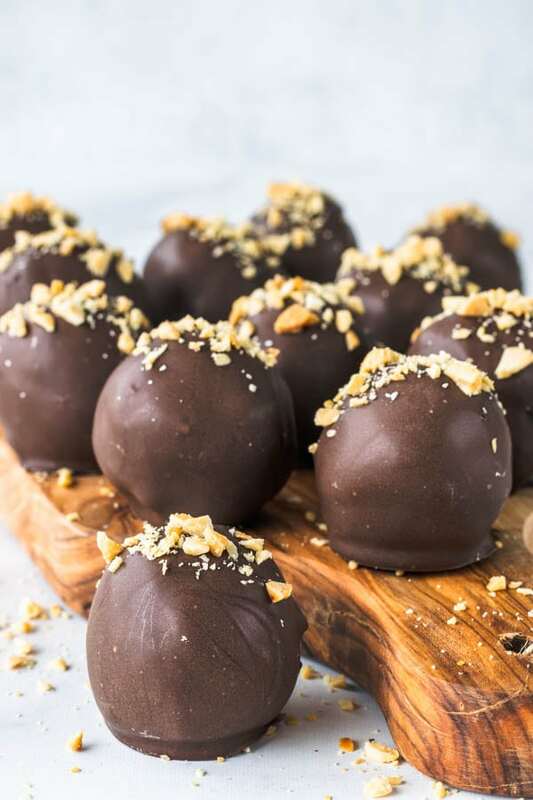 But if you like this recipe for my Peanut Butter Vegan Truffles, chances are you will also like: Hazelnut Vegan Cupcakes, Vegan Brownies with Caramel Sauce, Vegan Apple Bars, Vegan Peanut Butter Tarts, Vegan Peanut Butter Matcha Smoothie. Thank you for reading my blog. Have a lovely day! 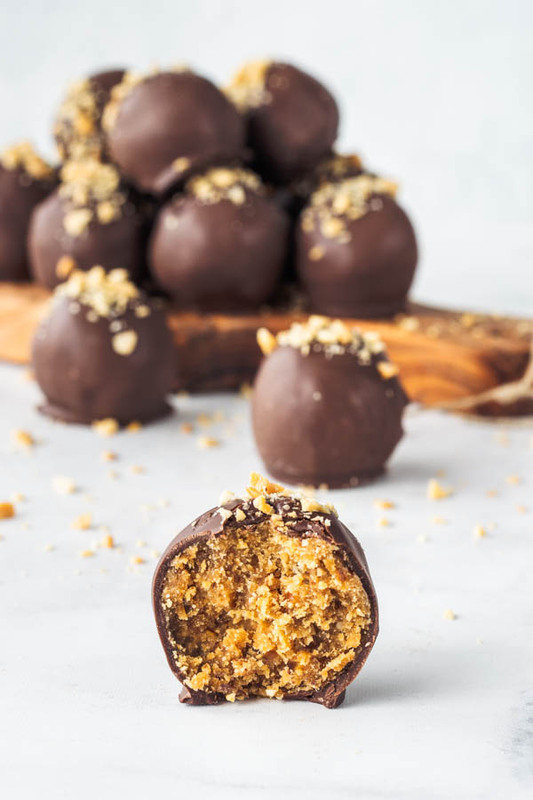 These Peanut Butter Vegan Truffles are paleo, gluten-free, refined sugar free, and absolutely addicting. Super easy to make, only 5 ingredients! Enjoy the recipe! 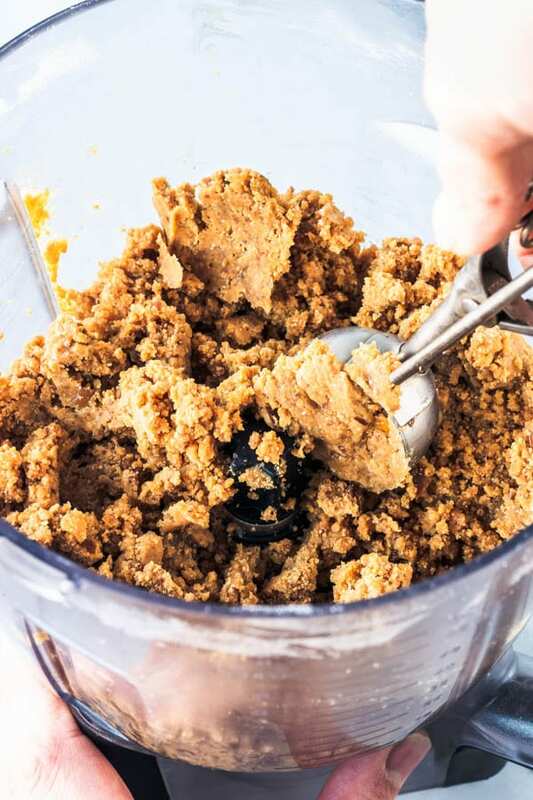 Add the peanut butter, dates, vanilla, and coconut flour to a food processor. Process until a smooth mixture comes together, very cookie dough like. 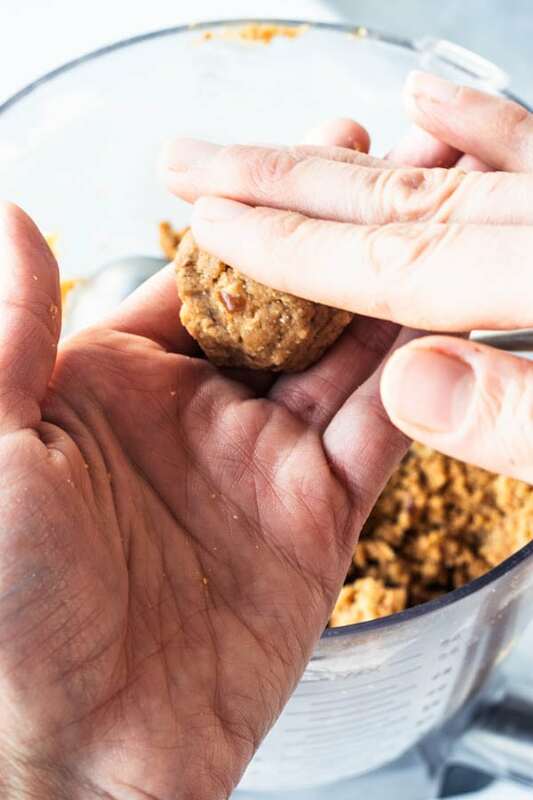 Scoop balls with a cookie scoop, roll them between your hands and place them in a baking sheet. 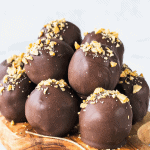 Melt the chocolate and dip the truffles one by one with a fork to help coat the truffles. 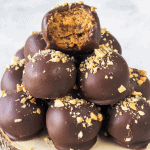 Sprinkle some chopped peanuts on top of truffles. Keep in the refrigerator for up to 1 week, in a closed container. 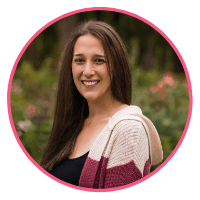 *I really recommend weighing the dates, because there are so many varieties and they can be all sorts of sizes. I used 8 dates, but my dates were huge! I used medjool dates. *If your dates are hard and dry, make sure to soak them in warm water for 15 minutes to soften them. Ca, fico muito orgulhoso de ver como você domina essas técnicas para fazer essas gostosuras!!!!!!! Obrigada! Agradeco muito, pai! Te amo! I’m a huge peanut butter fan, so I need to add this to my must-make list! 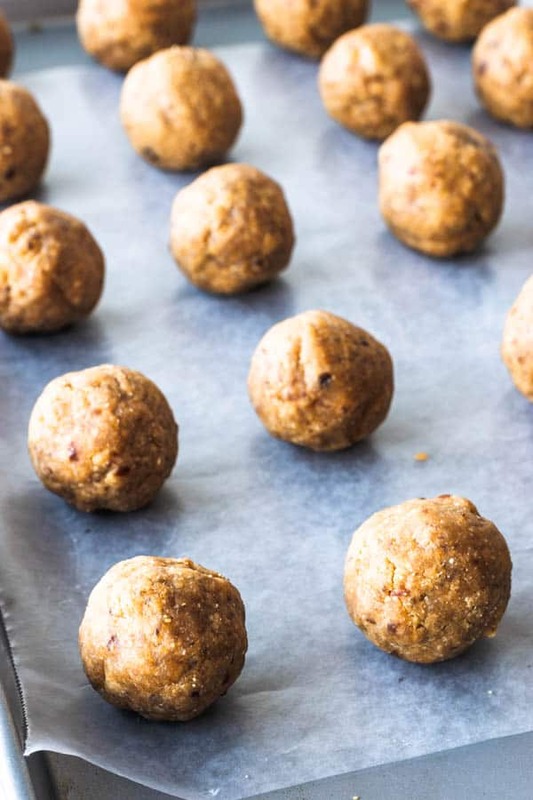 Love that they use minimal ingredients, and make a healthier treat! These look amazing, Cam! What kind of dates do you use? Medjool or fresh? I usually use medjool, but regular will work too!! And thank you so much Sarah!! !